Soca Rebels on new release by Faluma Africa! 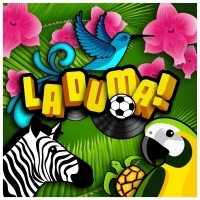 The Faluma crew is proud to announce that the compilation Laduma! is now available in all major download stores. The compilation is packed with tunes for the upcoming soccer world championship in South Africa. It features a great spectrum of music from the Caribbean, the US, Japan and Africa, as well as from various parts of Europe to support the high spirits of this huge event. Faluma crew is proud to present you the cream of the crop of African and Caribbean influenced sounds from all over the globe. The title LADUMA! is a popular cheer at soccer matches in South Africa meaning “he scores! / Goal!” (literally “it thunders”) in Zulu. Soca Rebels are a great example of how music ignores borders and geographical or cultural differences and just makes people dance and feel good – especially when it’s “Time 2 Jam” as it is during the world cup. More info here!